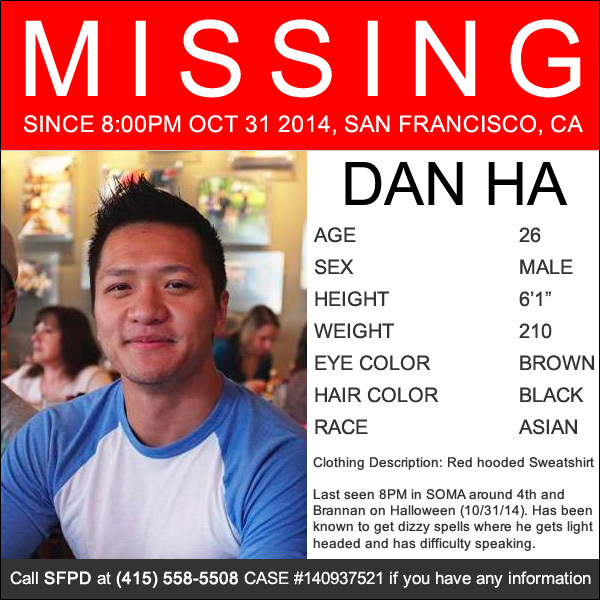 In San Francisco, friends and family members are asking for the public's help locating Dan Ha, a 26-year-old engineer who has been missing for nearly a week. He was last seen on Halloween. Ha, an iOS developer at a local startup called Metromile, was last seen by his roommate rushing out of the house in the SOMA district (around 4th and Brannan) on Friday night, October 31, at 8:00pm. He was supposed to be at a work event over the weekend and didn't show up. 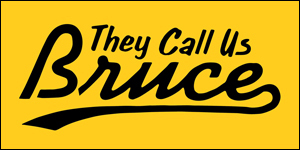 His co-workers filed a missing persons report with the SFPD on Wednesday. Sharon Heiny works with Ha and tells us that he left work early on Thursday with a headache. The following morning, Ha emailed his boss saying he was going to work from home. His roommate was the last to see him at about 8 p.m. He was rushing out of the house with a wallet and no bag. That was the last anyone has seen or heard from him, Heiny says. Dan Ha is 6'1" and 210 lbs with brown eyes and black hair. He was last seen wearing a red hooded sweatshirt. Anyone with information about his whereabouts is asked to contact the SFPD at 415-553-1373, and reference case number 140937521.